Angela is such a wonderful owner and she loves her Unity customers! Now, onto the business of the day. old and new stamps by the superbly talented Phyllis Harris. the job done right! But, I still love, love, love her artwork...who wouldn't? 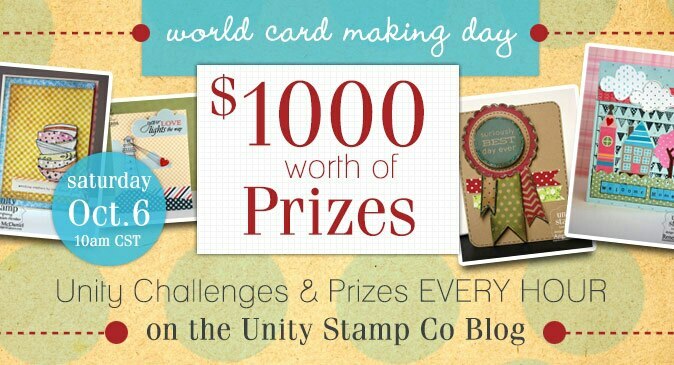 A lucky winner will receive a Unity prize! Now it's time to head over to Stephanie Muzzulin's Blog! What a fun fall card! OMG! That is soooo sweet! Love her and that ribbon was perfect for it! Adorable card! That stamp is super cute! Adorable image an a wonderful card! Oh my gosh! What a darling card and the colors are so pretty. The stamps super cute! Great job! Very sweet, and yes, I love P.H. artwork too!!! So simple and so cute card!! Cute Fall card!! Love how you did the ribbon with the buttons on each end, cute ! Fun card. You can just feel the joy! I think you did beautifully and I agree how can you not love those images!!! Don't know who's cuter the little girl or that sweet dog!!! How adorable is this image?! Love your design too, the stitching and the buttons that frame the ribbon, love it! I think you did wonderfully with the markers you do have! That is a great card with nice vibrant colours! Thanks for sharing it! What an adorable image - and beautiful card!!! LOVE!!! Sweet Autumn design. Love the coloring and stitching. Love how you used the buttons to border the ribbon! oh what a fun card you have there Shellye! Make me want to jump into that leaf pile! 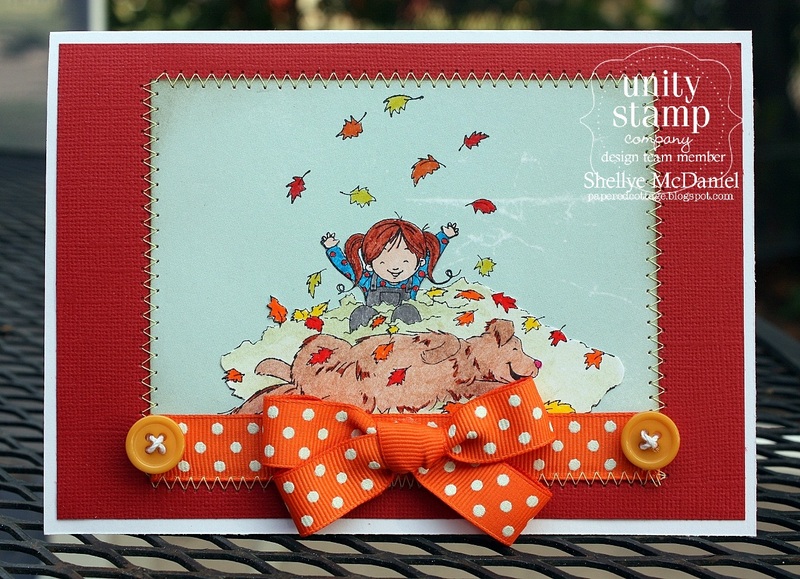 Adorable fall card...brings back fond memories of my leaf-jumping days. C U T E !!! Seeing that little girl playing so joyfully in that pile of autumn leaves made me want to jump right in there with her! Great job! This is adorable! 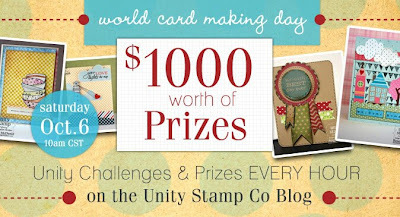 I love all the new stamps and I am going to place an order tonight!! These new stamps are great! Love your card. What a sweet card!!! Great fall colors! You are too the best person to represent PH stamps silly girl! What a beautiful card, I love it!! your project very cute. You have been really buzy. But, these are super cute! Super cute card, I love Phyllis Harris stamps! Thanks for sharing. Cute card you made for the hop. Adorable. The image is adorable!! Great card and colouring! Beautiful card,adore Phyliss Harris stamps! Super CUTE, love the stitching!! I just found your blog and L-O-V-E your style. thanks for sharing.